Day 3 of the PokerStars.com European Poker Tour Scandinavian Open came with a task, and that was to turn 40 players into 8. It seemed no problem at first when players rapidly dropped one by one, but as the day progressed and the final table bubble loomed, the pace came to a screeching hault. The feature table of the day included a whole heap of notable pros such as Roberto Romanello, Andrea Benelli, Thor Hansen, Jonas Klausen, and Rasmus Nielsen. Tore Lagerborg was the first casualty of the table when his queens couldn’t hold against Nielsen’s A K — with the A the first card to hit the felt. Klausen and Romanello then had a fatal collission where Klausen's two little fours were enough to scoop the pot against Romanello’s A J . The Welshman picked up €8,929 for his efforts, he can add this to his recent big win at the PartyPoker.com European Open V.
Other early busts (for €8,929) include Remy Bichel, Mika Puro, Ola Brandborn, Markus Lehmann, and Tony Ojala. One player who stood out throughout the day was Rasmus Nielsen. He effortlessly took on opponent after opponent, knocking most out with simple success and bundles of luck. When it came to Italian pro Andrea Benelli, things were not any different. Even aces couldn't stop him. Benelli’s pocket rockets were indeed cracked by Nielsen’s Q J when the board came down Q 9 8 giving Nielsen top pair plus an inside straight draw, which was delivered on the turn with the 10 . Following Benelli to the door with an €11,906 extra in their pockets also were Frederik Hostrup, Lars Christiansen, and Jacob Rasmussen. The monsterous chip leader Nielsen then took on Juha Lauttamus and put him on the other side of the rail. Short-stacked Lauttamus went all-in with A-8 versus Nielsen’s 9-5. A simple 5 on the flop and Nielsen had done it again. The final hand of the night came when Mikael Lundell moved all in for 114,000 with A 10 and Jussi Nevanlinna called with pocket nines. 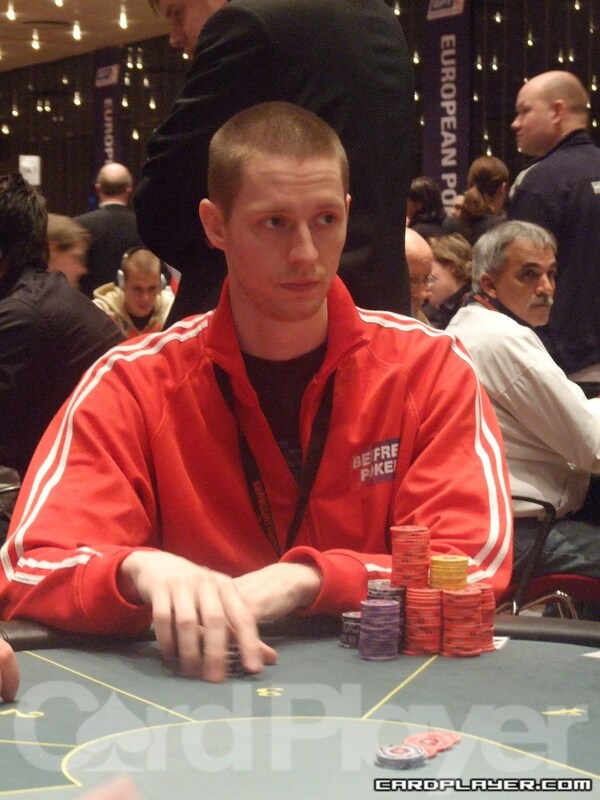 The nines held and Lundell became the final table bubble boy. These survivors can take comfort in the fact that no matter what happens they will be going home at least $101,128 richer. Before they take to the floor to compete for the $1,104,929 top prize, they will most likely be out supporting Theo Jorgensen and Gus Hansen along with many others at the boxing match today. Check back at CardPlayer.com for all the final table action later today at 1 p.m. (GMT) and tune into EPTLive.com for highlights.